Kipchoge was presented with a trophy after his run which he said was "history"
Eliud Kipchoge missed out on becoming the first athlete to run under two hours for the marathon by 26 seconds. The Kenyan, 32, clocked 2:00.25 but because in-out pacemakers were used, the time will not be recognised as a world record, meaning Dennis Kimetto's mark of 2:02.57 is still the quickest. But Kipchoge said: "This is history." Eritrea's Zersenay Tadese and Lelisa Desisa of Ethiopia also raced in the behind-closed-doors Nike event in Italy but faded earlier in the attempt. The three athletes chased the landmark time running 2.4km laps on the Monza Grand Prix circuit, 63 years to the day since Britain's Roger Bannister ran the first ever sub four-minute mile. Monza was chosen by the sportswear company for its gentle corners and favourable climatic conditions. Small groups of pacemakers ran pre-defined segments of the circuit before handing over to another group, and the trio did not have to slow down for feed stations as drinks were delivered by scooter. Kipchoge ran each mile at an average pace of around four minutes and 36 seconds. To achieve a sub-two clocking, the Olympic champion would have effectively had to run 17 seconds for 100 metres 422 times in a row. He lapped 27-year-old Desisa, who finished in 2:14.10, while Tadese, 35, came home in 2:06.51. Kipchoge always looked the stronger and was on target pace with around seven miles to go but he began grimacing in the closing stages and though he tried to sprint up the home straight, his fatigue was obvious. Pacemakers applauded and encouraged him as he approached the line and the clocking comfortably outstrips his recognised personal best of 2:03.05, set at the London Marathon in 2016. 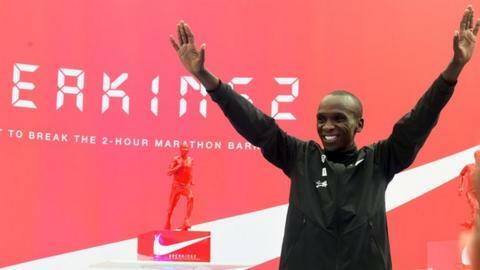 "I'm happy to have run two hours for the marathon," added Kipchoge. "My mind was fully on the two hours but the last kilometre was behind the schedule. This journey has been good - it has been seven months of dedication." Women's world-record holder Paula Radcliffe called Kipchoge's run "truly inspiring". Only a select few media were allowed in to witness the attempt at the race circuit near Milan and Kipchoge's time was initially reported to be a second quicker until Nike confirmed the 2:00.25 clocking. The brand paid the three runners to forgo the London and Berlin Marathons this year prompting some criticism of the event given the resources invested and the fact it will not count as a legitimate record. Nike's big corporate rival, Adidas, is planning its own sub two-hour marathon attempt but wants to do so in a race setting. Eliud Kipchoge is, I believe, the greatest physical specimen ever to line up on a marathon start line. If he can't run sub-two, then I don't see another athlete that will do it any time soon. Kipchoge ran close to the legitimate world record in London in 2016, and perhaps would have broken it in Berlin the year before if his shoes that day hadn't lost their insoles. He's made history of sorts in Monza, and he's right to be proud of pushing the boundaries. What he needs to do now is break the world record on an IAAF-recognised course. He has the talent to do that and the world record is all that's missing from a phenomenal career. Two-hour marathon bid - marketing stunt? Read more on Two-hour marathon attempt: Sporting excellence or marketing stunt?